NB: Refs B4367 [Bramling], B4368 [Chaffinch], B4369 [Goldfinch], B5379 [Willow], B5380 [Sycamore], B5381 [Hawthorn], B6129 [Holly], B6130 [Greenfinch], B6131 [Chestnut], B6133 [Bullfinch], B6134 [Hawfinch], B6135 [Primrose], B6849, B6850, B6865, B6866, B6869, can be booked together to accommodate larger parties. All on ground floor: Living/dining room/kitchen with patio doors. 3 bedrooms: 1 double, 2 twin. Bathroom with toilet. Shower room with toilet. Gas and electric heaters included. Travel cot and high-chair on request. Electric cooker. Dish washer. Fridge/Freezer. Small enclosed patio and furniture. Wheelchair access. Holidays run from Friday to Friday. For a better idea of where Moorhead Farm - Honeysuckle is, you can see Moorhead Farm - Honeysuckle on the map below. Moorhead Farm - Honeysuckle is in Devon; should you be on the lookout for a special offer, you can find all the special offers in Devon. It's always worth checking to see what is on offer at the moment. 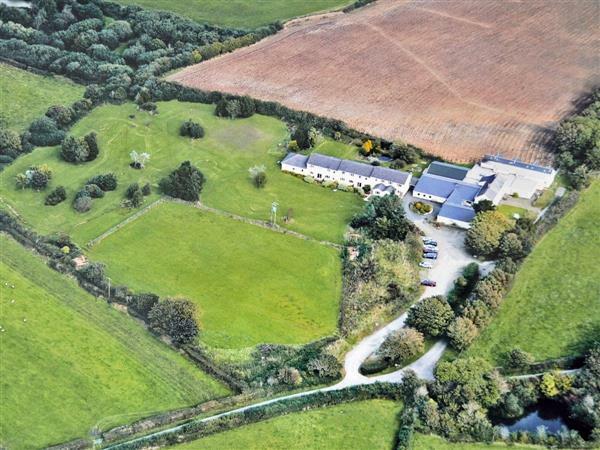 Do you want to holiday near Moorhead Farm - Honeysuckle (B6865), you can see other cottages within 25 miles of Moorhead Farm - Honeysuckle; have a look to find your perfect holiday location. Nassau Court - Westward Ho!